I have since upgraded to a Naim CD3-5 and lately a Naim CDX2 after the C540. My apologies to those whose emails I missed out during the past year as I do not check this email account often. The C540 is still in good working condition after 2.5 yrs of continuous usage. It is currently at the gf’s place in a much simpler system – NAD C540/Onix OA20-2/Mordaunt Short Classic MS20. I’ve just heard the system 3 days ago when I popped over. Wonderful little system – I’m still enjoying it although I’ve moved on to something more ‘luxurious’. As informed, the C540 no longer skips on normal CDs but is still quite fussy on CDRs. This is quite evident from the various reviews you can read on Audio Review. While the newer C541i series have better transports, it will be prudent to bring along some discs (CDRs even) for audition before getting the machine. It’d be better if you could get the dealer to open up the box and test the machine directly for any defects or problems. Fewer nightmares this way. Last but never the least. Keep on rocking! Happy New Year! I am a current owner of the NAD C540 CDP, bought for ~US$220/GBP£150. Prior to purchase, I've read enough reviews of the NAD C540's obvious tracking problems and that made me a little wary. Nonetheless, while I was auditioning for a new budget CDP for under S$400(US$220), I had to listen to the NADs. I've heard the Marantz CD4000-CD6000OSE range, the Rotel RCD-961(Above my budget. 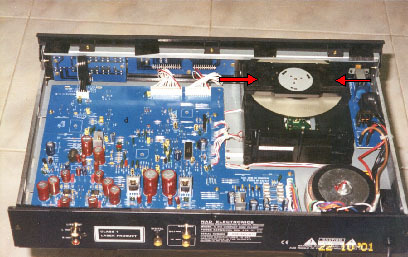 The RCD-951 was discontinued), the NAD C520, C521 and last but not least, the C540. The Marantz range of CDPs is great value for money (going as low as US$105 for the CD4000). Upon listening, they performed but were a tad to bright for my liking. The Rotel sounded very good but was over my budget so I had to let it go... NAD. I've listened to the 3 listed above. The C520 and C521 sounded very identical (aren't they supposed to be? ;P) but the C540 was a notch up with better dynamics and involvement. The C540 had a little more 'life' and wasn't too flat out compared to the C520/1. Okay, the issues. When I got it home and plugged it in, everything was great and the sound was up to my standards (relatively low). Did a few discs changing and the inevitable came. A track on a new disc I bought skipped (Cai Qin - Golden Disc 1, track 3, about 2 minutes into the track). The disc was perfect, I could see my zits in golden reflection. No scratch, no dust, nothing!! Now for the solution. I've gotten some Bitumen sheets that I had initially plan to use as a damping material to sit the CDP. I left it alone for a while and when I rediscovered it collecting dust in a corner, I've got other plans for it. I cut it up into small rectangular pieces to fit onto the transport brace/bridge. Attached are pics showing the bitumen pads. You will first have to unscrew 4 screws at the sides and a screw in the middle, at the back of the chassis. Slide it gently backwards, tilt and pull upwards. The arrows are all pointing on the bitumen pads on the transport. I think some other material might work just as well, including 3M double sided sticky white tape, blu-tack and thin pieces of Styrofoam. So long as you measure the height correctly. The Bitumen pads should just be touching the top of the case slightly when the top casing is being fasten down onto the chassis. This mod works great. The same disc doesnt skip anymore and I have not experienced any tracking error for quite a while. All the discs that used to skipped now track with ease. Only when the disc has a lot of scratches or the CDR is not burned optimally would I encounter the occasional skip. Bitumen sheet sells for about S$14(US$7.50) for a 30cmx30cm piece and you will only require a small portion of it. Now you can start enjoying your NAD CD player. This is a pretty straight forward and easy tweak, wouldn't break an arm or a leg in cost.